If you wonder whether step counter apps could improve your health, you’re not alone. These popular devices have taken the fitness market by storm. 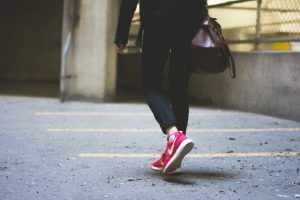 They start counting your steps the minute you put them on with varying accuracy and give a report when you ask or at the end of the day. Sometimes, before the day ends, you’ll hear the cheery message that you’ve met your goals. How did anyone decide that 10,000 steps was the right number? How did that magic number come to be? Was it based on monitoring thousands of people and those with an average of 10,000 steps were the ones that lived the longest or healthiest? No, it’s nothing that scientific. In Japan in the 1960’s someone calculated that for a Japanese man to burn 3,000 calories, he had to walk 10,000 steps. That may not be any magic number or even the right number for you. If you live a total sedentary life and this gets you going, it’s working. While there may not be a true scientific logic for those ten thousand steps, if the step counter gets you up and going, then it’s good. It creates a goal for you to meet and a challenge to get up and moving. Not everyone is sedentary. Some people already workout and put in quite a few steps a day. However, they also may sit at desk jobs or behind a steering wheel for long hours, too. For those people, an inexpensive timer could help remind them to get up and move for five minutes every fifty minutes. Moving around every 50 minutes is more beneficial to good health even for people that workout. Don’t give up the gym if you buy a step counter. One of the biggest problems with step counters is that people think it’s an alternative to a well balanced program of exercise. While it can be a great motivator for anyone that seems glued to the couch, it won’t provide all types of fitness. You need flexibility, strength, endurance and balance fitness. The danger comes not from the step counter itself if you combine it with a program of regular exercise to ensure you stay moving, but from relying totally on the step counter as an alternative to a program of exercise. Step counters may be a great addition to a program for runners or those whose only workout is a walk. It adds an element of challenge to their efforts. A step counter doesn’t provide any information on the intensity of a workout. If you’re doing a rigorous HIIT workout, you might register the same number of steps as you do if you walk a few blocks. Obviously, the HIIT workout is better for you. Those that provide information on the number of calories burned each day may give a false impression. They don’t measure oxygen consumption that gives the real amount of calories burned, but make an estimate. If you love technology, step counters can be fun. However, for most people, a program of regular exercise created by a personal trainer is the fastest and best way to get into shape.